It’s been a solid two years since the last Kuler 5 competition, so I thought it’d be time to bring it back since we have so many new creative designers in the Dojo community! We got a lot of great submissions two years ago, and I have no doubt we’ll get even better ones this time around. Kuler 5 is a friendly competition where designers create a 5 second animation using only colors from a specific Kuler color palette they create or find. The animation is based on a particular theme for that specific contest (such as ‘holidays’, or ‘water’). At the end of the contest, I’ll select the top 3 winners which I will showcase their work on the next DojoTV episode as well as provide some commentary and feedback. As winners, it’s a great way to gain exposure and recognition for your work. Even if you don’t win, making something and challenging yourself with restrictions helps you become more creative. 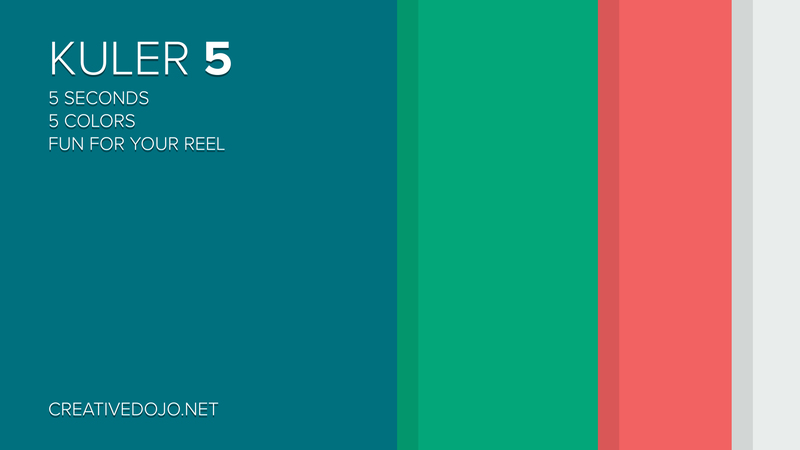 Kuler 5 is also a great way to create stuff to add to your demo reel! The theme this time is destruction, so get crazy and destroy everything! It could be funny, it could be serious, it could be anything, so get started creating something awesome! I’m really looking forward to all the submissions and can’t wait to see all the unique and interesting ideas you guys come up with. Let me know if you folks have any questions! Yes! So excited for this! Hell yeah, you were one of the dudes who asked about it! Cant’ wait to see your submission. Now if I can come up with an idea that I can actually execute it’d be nice. what kind of resolution and movie format do you need? 1920×1080 or 1240×720? .mov or H.264? Quick question, with the 5 colors, are we allowed to lighten or darken them for some depth or should it be a solid 5 colors only? Yes, limitations are the point of this contest haha! here’s is my competition movie. The idea behind this was to show how people act with our earth and what could happen. Very awesome work Micha, dig the Node2 use I believe?! Yes, I use Element 3D for the earth at the beginning and then Nodes 2. Yes, had some great days. Wow … that sound brilliant for you. I’m convinced that you make a cool video. Very awesome work! I like it! Hey this is my entry! This is awesome! Hilarious idea and well executed! Awesome work! Dig the crazy motion! Any website you would like to promote, such as your portfolio website, YouTube, etc? Awesome job buddy, love the colors and explosion! Awesome work Hieu, like the cat illustration! Here is my take on the project. For this animation, I did a play on Kuler = Cooler. Thanks for the challenge! It was fun! Thanks again…here it is on YouTube. I think it looks a bit better. This is my first 5 seconder. Good to be here and hope we have more such spaces. Good luck to all. Nice 3D work! Did you create all that in C4D!? Thanks. Yes, did it all in C4D. Nice work buddy, dig the cartoon comic look and illustration! Really like the illustration/cartoon look! Great work! Destruction is not what it seems!!! Very nice, love the pixel stuff! I’m sorry, I am late.. But I still finished my video.